A couple of years ago, a friend posted about revisiting Beverly Cleary books with her kids and I jumped right in with my own memories of Ramona. At the time, my oldest boy and I had read the Ralph Mouse books together and were just getting into Ramona, and I just couldn't wait to share the story of Ramona's winter underwear, monkey print dress with the sash, and most especially, pulling up that giant beet in the rain. My friend responded with: "Huh??" Yeah, those are all from the Ramona the Pest book, right? Apparently not. All those very vivid scenes I can recall in my memory seemingly as if they happened to myself? Not so clear after all. I had somehow transposed onto the first Ramona book scenes that are actually from a different, earlier Cleary book Ellen Tebbits. This is clearly not the book that most people remember from their childhood. Curious about the extent of my faulty memory, I finally checked a copy out of the library a month or so ago to share with my kiddos, and finally convinced them to let me read it to them. We were a on a bit of a Wonder and Wonder related stories binge there for a while, rightfully so. When I started Ellen, I worried it was far too old fashioned for them, and almost abandoned it as a read aloud because I feared I couldn't handle their criticism. However, after a pretty superficial explanation of woolen winter underwear they went with it. While I wouldn't say it was their favorite book we've read together, it was a perfectly pleasant reading experience. A question I've asked myself a lot lately as I share childhood favorites with my kids is "does it hold up?" When it comes to films, I'd say winners so far are the Indiana Jones series, Back to the Future series, and Goonies. On the "not so much" side are A Princess Bride (sad, sad sad for me. I still love it, but the kids just thought it was weird and not that funny. ), and Time Bandits. I'm still not 100% sure I ever actually saw Time Bandits as a kid and may be confusing it with something else completely. The version we watched a week or so ago seemed entirely new to me. I seem to be sensing a trend in my apparently swiss cheese memory bank. Flight of the Navigator is a push. Good story but the dated-ness of the technology was super distracting. Good candidate for a remake, if you ask me! So, does Ellen Tebbits hold up? On the whole, I would say yes, though it was a little boring to me this time around. The chapter where Ellen and her friend go horseback riding dragged even for me. And it seemed to take entirely too long for Ellen and her best friend Austine to get over the squabble at the heart of the plot the second half of the book. But that section of pulling up the giant beet from the vacant lot in the rain rang just as true as a hard won triumph to me as I remembered. And I was devastated and strongly annoyed with dumb old Otis Spofford and his Mexican jumping beans for taking away the classroom's attention on that, of all days. A browse of goodreads shows that Ellen isn't the favorite of many who go back to read her story as adults. It gets criticized as Cleary's starter story, and labeled old fashioned, slow, and quite a bit too tame. It's true, Ellen Tebbits is no Ramona Quimby. She doesn't have the high spirits or gleeful recklessness to get her into scrapes nor even the disarming charm that causes a reader to cheer her on as she bumbles her way out of them. What I discovered, though, is that I see a lot of myself as a child in Ellen. She's a quiet, reserved girl who longs for a little excitement and for someone who will see her as someone worth sharing a (quiet-ish) adventure with. Just like Ellen, I wanted teachers to like me and to ask me to clap the erasers outside. I wanted a friend I could always count on to bake brownies with after school and who maybe would want to dress up in a matching print. 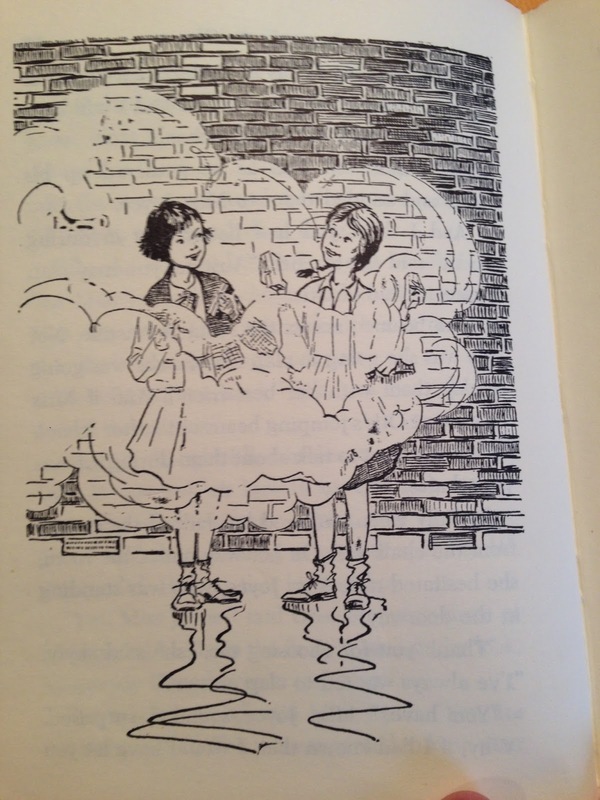 Beverly Cleary often got straight to the heart of children, especially in their disappointments and fears. It is in those ways I can relate to Ramona Quimby, especially as a parent. But I would never have been the kind of girl to pull another girl's curls to hear their "sproing", much as I might have imagined it. No, it's no surprise that decades later it's Ellen's story that's the one I have pictures for in my head. But perhaps knowing that Ramona was the more universally beloved child, I transposed that story on her name. Whatever the case, I'll always have a tender spot for dear Ellen. I'm glad I had the chance to get her story straight and revisit her world for a little while.